"I wanted to take time to thank you for all that you have done for me. I felt very blessed to have you for an attorney. John you are an excellent attorney. It was my pleasure to work with you. Thank you once again. Take Care." Thank you for all the support you've done for me. Thank you for all the patience and for all the time spent with me and Thank you for specially looking out for me. Forever, I will cherish you. With all the respect." "Thank you for all you've done & our prayers are with you… Best Thoughts." "Mere words cannot express my gratitude for all your help & hard work for my brother. Our family cannot thank you enough. If there is anything you ever need, please call. Thanks again." Thank you very much for all your help and great kindness. God bless!" I truly appreciate your efforts. It makes my heart heavy to know that you care. I can feel hope knowing that you are on the case." 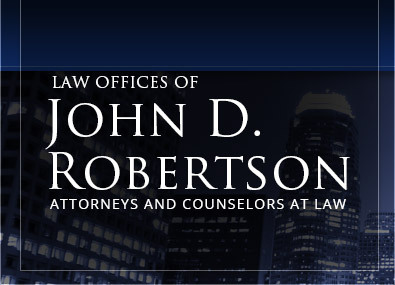 "Attorney John D. Robertson Esq. As we review the past year, and all the financial challenges we have experienced, we just want to take time to thank you for all you and your staff have done to help us. Your professionalism and emphatic manner will never be forgotten. May God continue to bless you." This program is like a giving tree. Through the years, this tree has been watered, cared for & nourished by selfless individuals such as yourself. Thank you for all your time, effort & dedication. You have contributed greatly to our personal growth & learning this summer. We hope to pass on this legacy of giving back to the community as future attorneys." I can't believe it's almost 10 years since you unselfishly mentored me. I thank God for your life and pray for more blessings your way. God Bless!" I can't begin to express to you the appreciation my family and I have for you. You are and have been wonderful in listening to my son, as well as looking at who he really is as a person. Thanks so much and may God bless you always." "THE COURT: Specifically – Well, first of all I want to say something beforehand. – If I may point out something that I thought was excellent, and … some of you deserve it. Mr. Roberson's cross-examination was probably the best cross-examination I have seen in the last few years. Too often with the skills of lawyering sometimes you are afraid you are going down the tubes, and to put it in the vernacular, I thought that Mr. Robertson's cross of [the witness] was superb. I really enjoyed it, watching it. It was fun to see it done. I think it deserves to be pointed out because I wish I saw a lot more of it. As I say, Judges enjoy watching. It doesn't make any difference which side does it. We are good lawyers at work."